D'Addario EXP74CM Mandolin String Set Inspired by Chris Thile. Part of a giveaway to include D'Addario's NS Tuner, Strap and Capo. New York, N.Y. — To celebrate the introduction of D'Addario's EXP74CM, a new custom medium coated mandolin set inspired by mandolin virtuoso Chris Thile, the Mandolin Cafe and D'Addario will launch a giveaway on December 24 with five winning entries selected at random December 31. Each winning entry will receive 5 sets of D'Addario EXP74CM Mandolin string sets, a Planet Waves mandolin strap, NS Micro Tuner and Mandolin Capo. No purchase is necessary to enter and the giveaway is open to all visitors to the Mandolin Cafe. The starting point for registration will be from a link on the Mandolin Cafe home page. 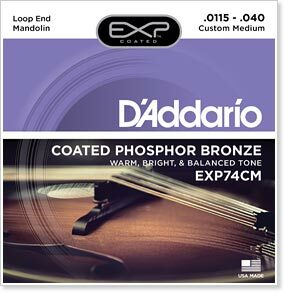 "This EXP coated phosphor bronze set is a custom-gauged hybrid based on Chris' preferred studio and tour setup," says Brian Johnson, D'Addario Product Specialist. "These strings feature warm and bright phosphor bronze tone with the optimal blend of playing tension and projection." D'Addario's proprietary EXP coated mandolin strings now feature plain strings and hexagonal cores made of their revolutionary NY Steel. Envisioned, perfected, and manufactured by D'Addario in New York, this high-carbon hex core and plain steel wire have been meticulously engineered to be stronger and more consistent than any other standard musical wire, leading to a string with superior strength and pitch stability. D'Addario & Company, Inc. is the world's largest manufacturer of musical instrument accessories, marketed under several product divisions: D'Addario Fretted and Orchestral Strings, Evans Drumheads, Promark Drumsticks, Puresound, D'Addario Woodwinds, and D'Addario/Planet Waves Accessories. A family-owned and -operated business with more than 1,100 employees worldwide, the company manufactures 95% of its products in the U.S., employing Toyota's Lean manufacturing principles. D'Addario has a distribution network in 120 countries and serves more than 3,000 U.S. retailers, all major e-commerce sites, and more than 3,000 endorsing artists. Hook me up! Those sweaty hands of mine make mine tarnish in no time! Some really fine goodies. Sign me up! Never tried any coated strings, will be interested if I win! Guess I'll close this thread down because that gets everyone rubber necking to see what has been said. Some of you continue to think you're registering for giveaways by plunking down a post on the forum. That will never occur again as long as I run this site. If you read the article this links to you'll see the registration does not occur here. If you would even read the opening post you would see registration does not occur until December 24. It is December 23. Slapping my head in disbelief. I give up.